We all want to be as productive as possible at work. But sometimes we find our productivity slipping and can’t really identify the problem. There are several reasons you may not be accomplishing as much as you’d like. Unclear Goals. If you’re not clear about what it is you want to accomplish, you probably won’t accomplish much. It helps to be really clear about the vision and mission of your work and what your priorities are. To correct this problem, you need to go back to the beginning and determine your goals. Then you need to focus on making sure that everything you do supports those goals. Multi-Tasking. People once considered multi-tasking a positive thing. But we now know that if you spend your time trying to do too many things at once, you’re not going to be focused enough to be productive. Time Wasters. There are so many things that can take away your time throughout the day including phone calls, email, social media, and online news. If you want to procrastinate, it doesn’t take much effort. 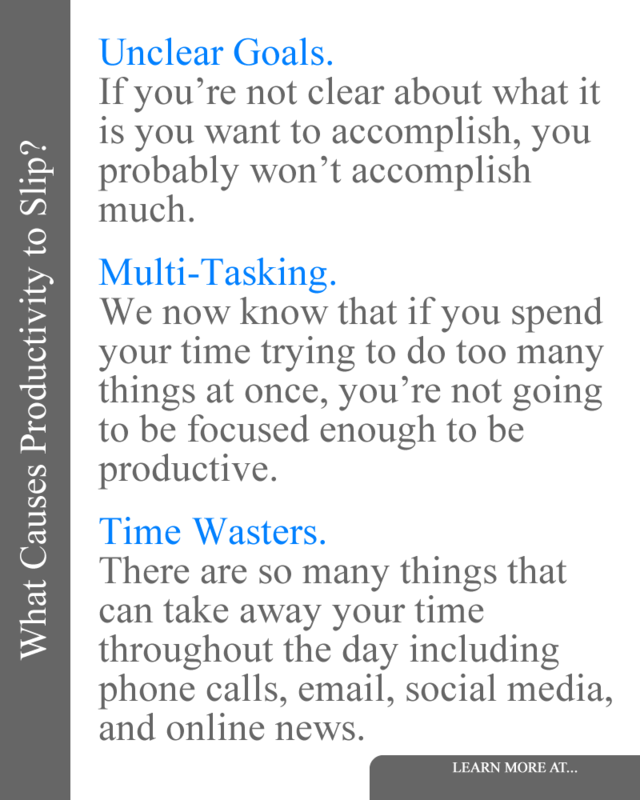 But all of these things can take away your productivity. Dissatisfaction with Work. When you like what you’re doing, it’s easier to get a lot done. But when you don’t enjoy your work productivity can lag behind. The solution for this is to focus on the positive things about your work. That may even mean taking your business in a different direction where you can achieve more satisfaction. Outdated Equipment. Sometimes your lack of productivity may be a result of your office equipment. If your computer is very outdated or you’re using a very old version of software it may be slowing you down. It does cost money to upgrade, but you’ll usually make that back with more work accomplished. Personal Issues. If you’re having trouble personally, it can make it difficult to get work done. It’s natural to have things on your mind that take away from your productivity. You can improve this situation by getting help when necessary. You may also find it helps to practice stress management techniques such as deep breathing and meditation. Exercise can improve your mood and help you to take your mind off of problems. Addressing personal issues head on is better than avoiding them. Once you identify the problem causing your productivity issues, it makes it easier to make necessary changes and improve your work habits. It doesn’t take much to cause your productivity to slip, but small changes the other direction can make big improvements. The post What Causes Productivity to Slip? appeared first on The Coach Curl Academy.